Bacon Bros. Public House features a locally sourced, made-from-scratch menu. Regardless of which location you visit, the goal of Bacon Bros. is to serve you the highest quality, farm fresh ingredients and food in an engaging, warm environment with superior service. The warm and rustic decor is a nice compliment to the accessible fare and fits with the restaurant’s approachable, farm fresh theme. Simply put, Bacon Bros. Public House is a great bet for a fun, relaxed dining experience with friends and family or happy hour with your colleagues after work. 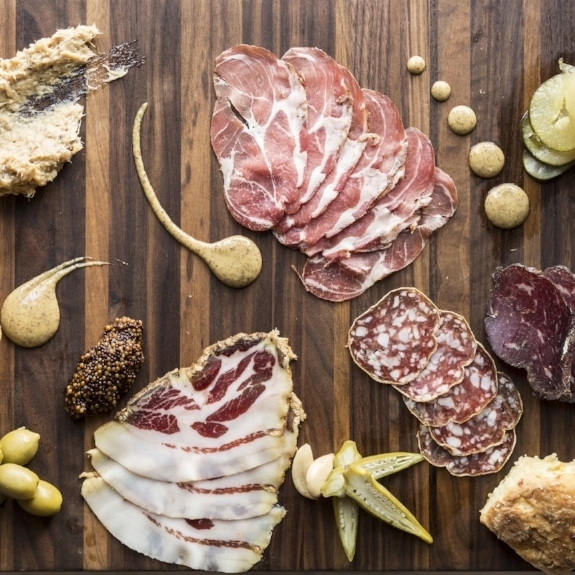 We take the time to craft house-made charcuterie from the best pigs, using traditional methods. Our selection is always changing as we try new ideas, but a few of our favorites include: Rillettes, Pâté, Bresaola, and Bacon Bros. Country Ham. We take our 'Que seriously, and it's seriously delicious. From slow-cooked pork shoulder to some of the best darn St. Louis ribs around, brace yourself for some smokey, porky goodness. Nothin' says comfort food like shrimp and grits! We take this Southern staple and bring it to the next level with house-made chicken andouille sausage, okra, smoky tomatoes and rich neck bone gravy.